Commercial buildings often have flat or low-sloped roofs that need special drainage solutions. This article will give you an overview of the types of drainage systems suitable for commercial buildings and the materials and components of those systems. Also, we’ll cover what kind of maintenance a flat roof drainage system requires. The basic function of a roof is to protect the building from the elements. As the roof collects rain, the water must be transported quickly and safely away by a drainage system. While pitched roofs can rely on gravity to move water, flat roofs can’t just rely on a typical gravity‐driven gutter system. 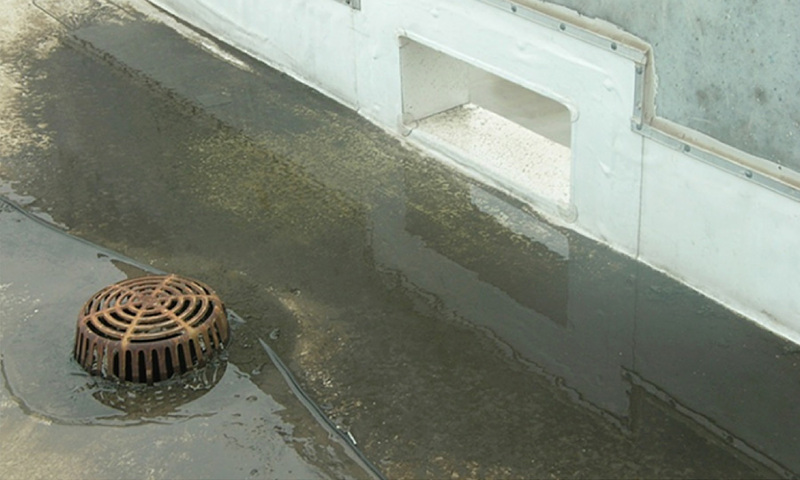 Commercial flat roofs need interior drains and scuppers to collect water instead. Though many think flat roofs are completely level, they are actually designed with a slight pitch. Architects and structural engineers add the pitch in order to create positive drainage. This small slope will direct water towards the drains, whether they’re in the centre of the roof or to one side. Positive drainage should allow the water to drain off the roof 24-48 hours after it stops raining. Architects must also take into account the weight of water on the roof, including near the drainage areas. Water adds significant weight to a building, especially if the drains are clogged or poorly implemented. Water collection can overload a roof’s weight capacity and can even lead to a collapse. This can happen if the water simply doesn’t drain fast enough, creating a backlog of water. Backup drains can mitigate this problem. The backup drains are positioned higher than the main drain, just like the backup drain in your bathtub. If the main drains can’t drain water quickly enough, the water level will rise to the height of the backup drains, where it can flow out safely. Water may also collect on your rooftop in areas where it is too flat to have positive drainage or where a depression has formed. This water collection is called ponding. Over time, materials, such as wood and concrete, will sink under the load of the water, and insulation may compress. This will create low points on the roof, which may collect even more water. Birds: While birds most commonly nest on rooftops, standing water may encourage them to drink on your rooftop instead. Anything you can do to make a roof less attractive to birds is a smart investment that will limit their damage. Mosquitoes: Small ponds of standing water are breeding grounds for mosquitoes. 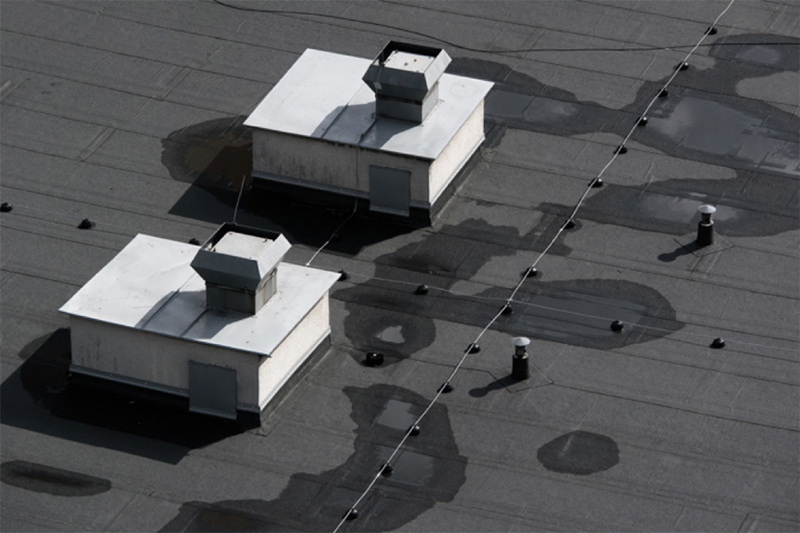 If your roof has standing water, then you’ll have a higher mosquito population, which can annoy your building patrons or even spread disease. Plant growth: Algae and even larger plants will take advantage of standing water, and their growth can make cleaning the drain more challenging, contributing to clogs. Fungal growth: Fungus prefers wet conditions and may grow in standing water. It may also damage the roofing materials. Wear on the roofing materials: Most roofing membranes will deteriorate under standing water. Therefore, ponding water may void your manufacturer’s limited warranty. Positive drainage should dry the roof completely in a day or two after a rain, assuming the weather holds. If your roof still has ponding after this time period, then it and the drainage system need to be assessed by a roofing professional. Water collection can be more serious than ponding. Overflow can create leaks by pushing water into areas it would not normally go. The severity of the damage depends on where the water ends up. All drainage systems should have backups to prevent overflow in the case of severe rain or in the case of a clog in the main drainage system. 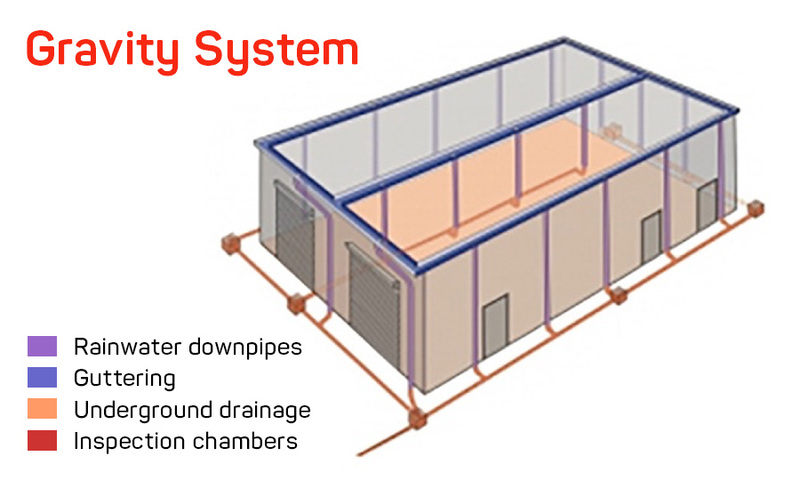 A gravity drainage system simply relies on gravity to move the water from the rooftop to the ground. 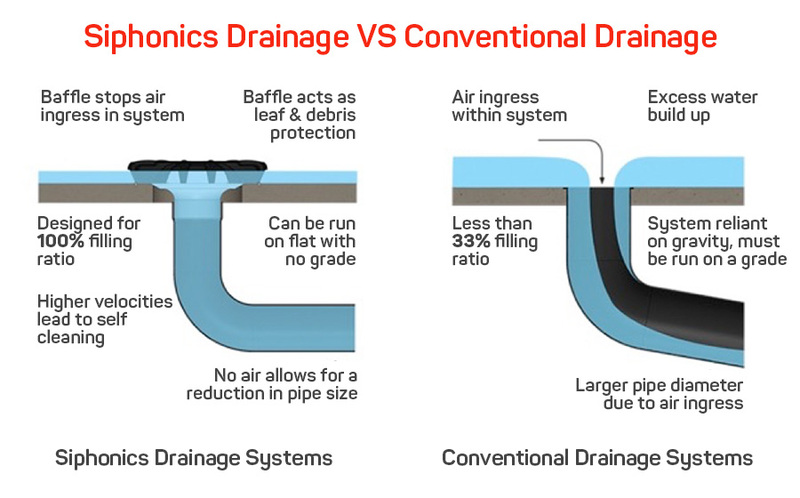 Usually, a gravity drainage system has four sloping drain segments that connect to an interior drain, which then carries the water outside of the building. A flat roof may use interior drains to collect water from the centre of the roof. These drains are like the drain at the bottom of your shower, except that the roof drain has a larger strainer to protect it from debris. Still, the function of the two drains is the same. Water falls on the roof, and gravity draws it into the drain and down the pipes. A residential roof collects water in the gutters and the downspouts. All of these pipes are on the outside of the home. However, the drainage system on a commercial building needs internal pipes to connect to the internal drain. This makes the drainage system a little more complicated and reduces the room available for other building systems directly beneath the roof. Gravity drainage systems are only recommended for flat or low-slope commercial roofs that have a surface area of less than 150m2 per drainage point. Larger roofs collect more water that may not drain quickly enough with just a gravity system. Those roofs benefit from siphonic drainage systems. 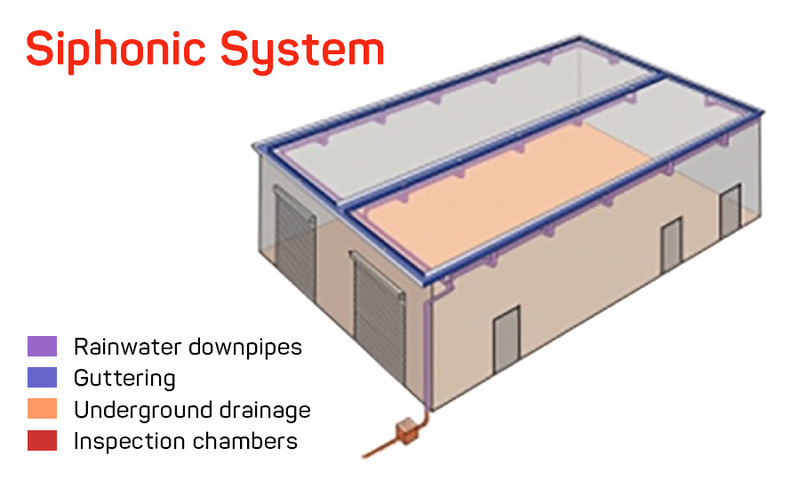 A siphonic drainage system has, on the drainage points, a baffle that prevents air from entering the system. As a result, the pipes have lower atmospheric pressure than the outside environment. Thus, when water enters the drain, it meets an area of lower pressure in the drain and is pulled in faster than it would be by gravity alone. 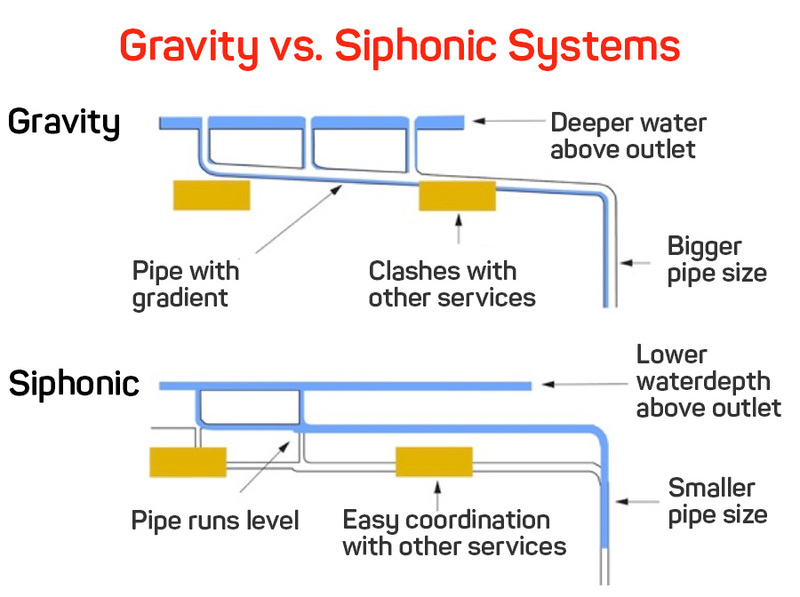 In fact, a siphonic drainage system can achieve 100 times the drainage speed of a gravity drainage system. In a siphonic system, several drainage points will meet up and deliver the water out of the building. However, this internal drainage pipe doesn’t have to run on an incline, as the system does not need gravity to function. 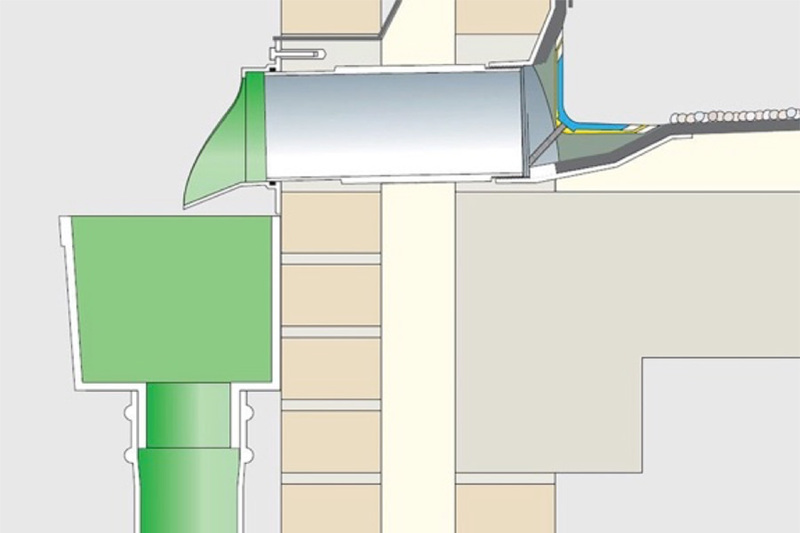 Instead, the collector pipe is installed at the highest possible position and then runs flat until it connects with the “leader” vertical down pipe. This allows for more room for other building features below the drainage system. Also, the roof itself may have a smaller slope and still drain properly. A building with a large roof footprint, such as an airport, mall, warehouse, convention centre or factory, is well‐suited to a siphonic system because the weight of water on these buildings is a bigger concern. If the water on these roofs does not drain fast enough, then it can add significant weight to the roof. In fact, a single inch of water on a 20-square foot area of the roof weighs 2,000 pounds. That is a challenge for architects to plan around, so roofs need to drain water as quick as possible. Siphonic drainage systems are generally recommended for larger roofs of 150m2 or more. 1.Interior drain: This is a drainage point that can be installed across the roof’s surface, even in the centre of the roof. If water collects in one spot in the middle of your roof, then installing an interior drain there to move the water is a good solution. Interior drains work best when the roof is sloped to allow water to gather at the drainage point. However, that isn’t always enough; so interior drains can be used in combination with scuppers, which drain water at the edge of the roof. 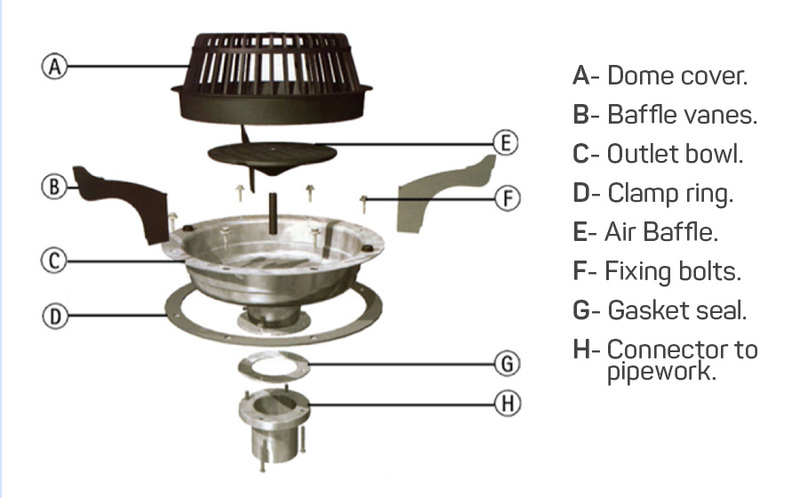 Dome strainer or cover: The top of the interior drain is a mesh or strainer that prevents debris from entering the drainage system. Building codes mandate the height of drain strainers. Most recommend at least a 4‐inch cover, but you should always check your own building codes to be sure you comply. Also, make the strainer highly visible so it is it less of a tripping hazard for those on the roof. 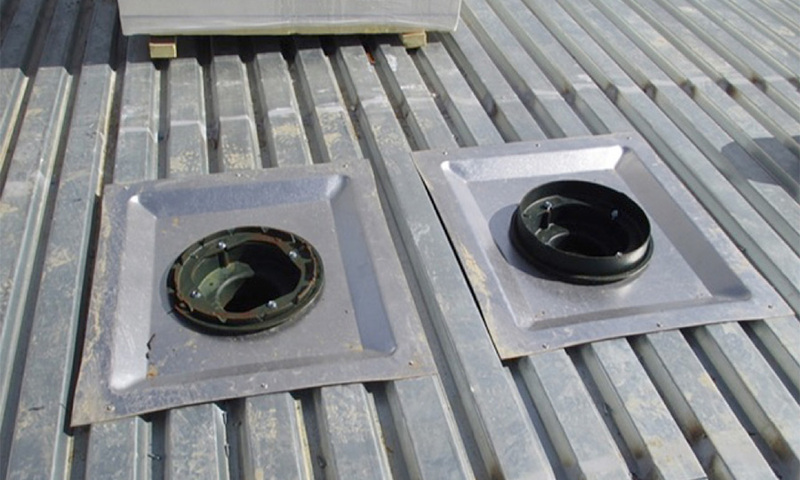 Flashing or clamp ring: A watertight ring holds the drain and strainer together around the roofing membrane and prevents water from leaking into the base of the drain. Outlet: The outlet is simply what connects the drain to the pipes below. Air baffle: The air baffle prevents air from entering a siphonic drainage system. Different drainage systems require slightly different interior drains. Your roof might need a high-capacity drain, or a dual-outlet drain, to move more water off the roof faster. Another interesting interior drain modification is a sump pan. These square pans create a recessed drain, which draws water towards drains that otherwise might be too high for smaller amounts of water to reach. 2. Edge drains: Edge drains collect water at the edge of the roof. To understand the need for edge drains, think of a public shower. Just like a commercial roof, the ground in a public shower is flat. If enough shower heads are on, the water will spread out away from the drains, and a backlog of water will develop. On a roof, this is a problem because you don’t want water to reach the edge and run down the side of the building. 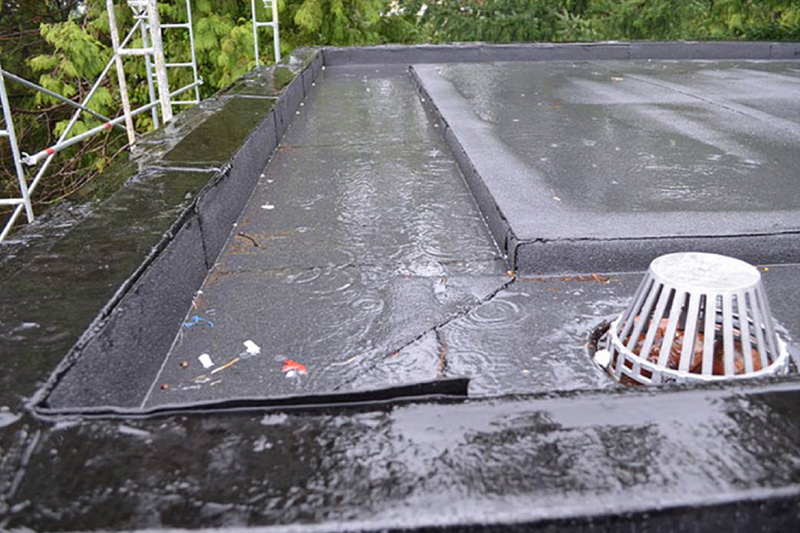 To solve this problem, professional roofers install edge drains to catch that excess water and ensure that no one on the sidewalk below the roof gets splashed. Scupper drains: A scupper is a drainage point on the edge of the roof. They are incorporated into the walls or parapet. Usually, scuppers are part of the backup drainage system that helps the roof shed excess stormwater. If a scupper is part of the overflow system, then it will be a few inches, typically two inches, above the roof surface. If it is part of the main drainage system, then it will be level with the roof. Scuppers tend to be cheaper than interior drains because you don’t have to open the roof or run as much pipe to install them. A scupper may take the form of a channel, with an open top, or it may be closed and flashed into the wall. It may direct water into a gutter system, or it may let the water run down the side of the building. However, because it is not ideal to have water run down the side of the building, scuppers that allow for it are usually part of the peripheral drainage system and therefore are only active after extreme rainfall. Whether it is a main or backup drain, a scupper is flashed in galvanized metal to prevent leaks and corrosion. Occasionally, you’ll see scuppers with decorative faces, for beauty. Scuppers need to be checked for ice, as they are normally colder than the rest of the rooftop, being up on the wall and further away from the heat of the building. Those who install new, thicker roof membranes may end up blocking their scuppers. In that case, scuppers should be moved up the wall or replaced with higher scuppers. Gutters: Gutters are shallow channels that collect water at the edges of the roofs. 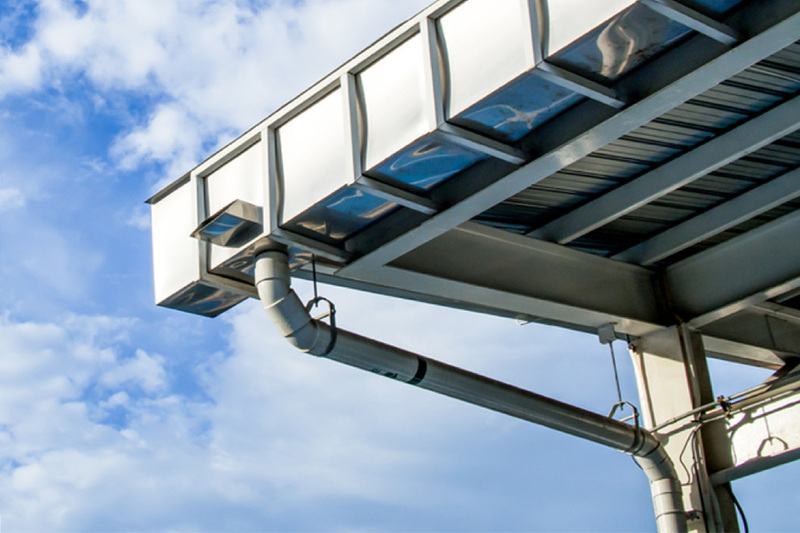 While gutters are more common on residential roofs, they can still be used on commercial roofs, as a complement to interior drainage or by themselves. An architect can slope the entire roof towards an edge. On that lowest edge, the roofing professional installs gutters. The gutters will collect the water and connect it to a downspout. Downspouts (or roof drain leaders): A downspout carries water away from the scupper or drain to the ground. Downspouts are usually cost-effective because they can be installed on the side of the building without altering the building. The roof drain leaders on commercial buildings may need to be larger than residential downspouts to handle a higher volume of water, or you may need multiple downspouts to meet the need. You also have to consider the material these parts are made of. Drains and pipes of different materials can be of vastly different quality and can solve different problems you might face with your drainage system. Each of these materials has its own benefits and drawbacks. Cast Iron: Historically, the most popular drainage material, cast iron, has many advantages. It is heavy, which makes it both durable and quiet. While older cast iron tended to clog, modern cast iron coatings prevent buildup in pipes. Still, cast iron is the most expensive material. To cut costs, it is normally only used for the drainage cover, where its superior strength is a huge advantage to keep large debris out of the system. PVC: Plumbers have been using polyvinyl chloride (PVC) as a cheaper alternative to cast iron for over a century now. It is nontoxic and abrasion-resistant, and is much easier to cut into unusual shapes. Though it’s generally cheaper than cast iron, it is a weaker material. Propylene: A much more recent invention than PVC, propylene is made from a petroleum waste product. It is also called propene or methyl ethylene. It’s similar to, but has several advantages over, PVC. First, it is much less likely to burn during a building fire. If it does burn, it releases relatively harmless smoke, while PVC releases hydrogen chloride, a toxin. Polypropylene is also highly solvent-resistant, so it is frequently used for industrial purposes. However, propylene is the lightest plastic piping available, which makes it a poor choice as a roof drain cover or strain. ABS: You may see some drainage system components made from acrylonitrile butadiene styrene (ABS). It’s quite similar to PVC, but because it performs poorly in the sun, it is rarely suggested for use on a rooftop, especially not as a drainage cover. Paint and pigments can keep ABS from degrading as quickly in sunlight. Interior drainage piping made from any of these materials will require insulation to keep the water from freezing in cold temperatures. Why do you need to insulate your drainage system in the first place? 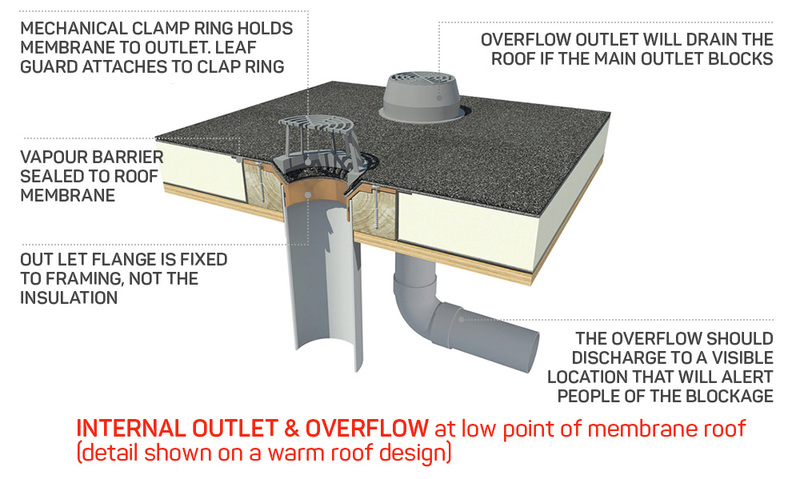 Drains are roof features that penetrate the roof and may allow conditioned air to escape. Without roof insulation, drains could cost you a fortune in heating and cooling costs. Also, water may freeze in the pipes and damage your system. How much insulation your drainage system needs will depend on your climate. In fact, in 2012 and 2015, the International Code Council changed its rules in the International Energy Conservation Code (IECC), requiring more insulation for roof drains. The first change was an increase in thermal R-value a roof has to achieve in each of the American Society of Heating, Refrigeratng and Air‐Conditioning Engineers (ASHRAE) regions. The second change is that this R‐value must be achieved within four feet of the roof drain. Formerly, you only had to achieve the R‐value as an average across the roof. Now, in order to meet the value within four feet of the drain, most roofs will need considerably thicker insulation, or a new type of insulation, such as polyiso insulation. Your state, province or other local jurisdiction may have adopted the IECC’s changes, or it may not have. It is incumbent upon the roofing professional and building owner to find out which insulation rules apply to their drainage system and to abide by them. Your locality may have also implemented changes to drainage rules to help deal with urban runoff problems. Rooftops in dense city areas collect a large amount of water and not all municipalities have siphonic drainage systems that can move this vast volume of water quickly. Instead, the water backs up and may flood into people’s homes, as well as rivers, streams and bays. As this water is untreated, it may be a health risk. To prevent overloading their drainage system, municipalities may require that commercial buildings install control flow drains. These drains actually slow the rate of water flow off the roof, so the volume of water is more manageable for the city’s infrastructure. For a few hours after the rain, a commercial roof with a control flow drain will act as a reservoir, holding the water to prevent damage to property and wildlife. Another solution that can help storm-water management efforts is vegetative roofing, which can absorb vast quantities of rainwater. Instead of being delivered into the municipalities’ drainage system, the water will be used by the roof’s vegetation, over time. Building owners will also benefit from familiarizing themselves with the basic requirements of drainage system maintenance. On an annual or semiannual basis, all drainage systems should be inspected and cleaned. If your roof has a history of drainage clogs or problems, then you should have it inspected and cleaned even more frequently. Further, if the building you manage or own is in an area where trees shed their leaves every fall, then one of these cleanings should take place at the end of autumn when your system will collect the most debris. Remove all debris and objects from the roof and drain. Check for standing water, ponding and drainage speed. Check that drain screens are secure and highly visible. Ensure roof drain leaders (downspouts) are directing water safely. Any trees or other landscaping features that are close to your roof should be trimmed. While some roofing professionals may perform this task, you may find it better to hire a landscaper to do this work before the roofing professionals arrive. If you wait until after, then the landscapers may unknowingly leave debris on the drain. You can use IKO’s commercial roofing contractor locator to find a roofing professional who can maintain your roof drainage system for you. Or he/she can answer your questions about any repairs or changes your roof’s drainage system may require.